Happy Birthday Wishes for your Husband: As we know that celebrating the birthday of your loved ones is something we all look forward to, but when it’s your husband’s birthday, you will definitely go that extra mile to give him the best birthday wish. There are many great ideas to celebrate your partner’s birthday and gift him something he would love. Planning to surprise your husband with a great birthday gift. There are many options you can select from. You can always give your hubby a nice branded perfume which he would love. There are many options in the apparel section for men, including shirts, jeans (denims and non-denims both), etc. You can add some accessories such as belts, ties, wallets, etc. Going the extra mile: If you don’t want to pick out anything from the regular and ordinary gifts which you have been giving him for many years now, how about a special, romantic date just for the two of you. You can decorate your bedroom with scented candles, balloons and put some fresh flowers in the vases. This will enhance the look and feel of the room. You can get a small, say half kilogram cake as well, heart shaped or any other way he likes and cut it in the room. You can also try these wishes and pick up lines and can write on birthday card on his birthday. These lines can makes happy. 11. Dear love, you are not my number one, you are my only one. Happy birthday, husband. 12. My love always grows for you with each passing day, your birthday is our special day. Let us celebrate together dear. Happy birthday, husband. 13. I hope I get to wish you on your birthday for as long as I live. Happy birthday, sweetheart, you are the best husband. 14. On your birthday, I wish you, my dear husband, a life full of both health and wealth. Much love, happy birthday. 15. Happy birthday, my dear husband, I want to thank you on this special day for encouraging me and supporting me. 16. Dear loving husband, we are one soul divided into two bodies. Happy birthday to you, live longer and happier. 17. Wishing the most wonderful husband a very happy birthday, i promise you to make this day even better than before. 18. Growing old might sound bad, but I don’t mind growing old with you. Happy birthday dear husband. 19. Husband, I want you to know that despite our differences over the years you are still my everything. There is nothing our love cannot weather. I am grateful even for all our disagreements because it was still time I got to spend with you. 20. I can’t imagine a world where you weren’t my husband. I tried to once, but I couldn’t get past how I would live without you there to do my bidding! Thanks for loving me all these years, and thanks even more for always taking out the trash. 21. You are the embodiment of all that is right and good in my world. Having a husband as terrific as you has proven to me that dreams really do come true. I hope all your dreams come true this year as well. 22. When I first met you, I felt an instant connection. Years later I feel it still. 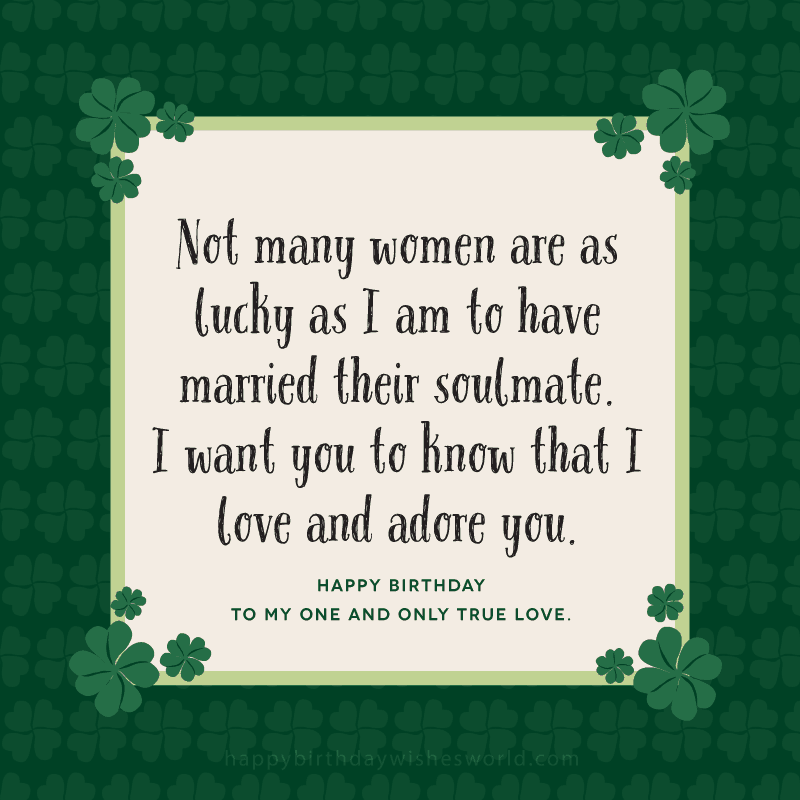 I am so fortunate that I was able to marry a man who was not only my better half but my soulmate as well. Happy birthday husband! These are some of the finest ways to give the best happy birthday wishes for husband. You can select any of these methods and see your husband get surprised on his special day. Thank you !